East Boston is situated on the front line of climate change. Made up of five islands joined by landfill, East Boston is a peninsula that connects to Boston proper by two underwater automobile tunnels and an underwater transit tunnel. Located within a recognized flood zone, the people there have had regular reminders of their climate reality via hurricanes Harvey, Irma, Maria, Sandy, and the so-called “bomb cyclones” during a blizzard last winter. The Neighborhood of Affordable Housing (NOAH) is a thirty-year-old community development corporation that works on affordable housing and then takes it a step further, enriching the lives of people who live there. Boscio Santos, who has been at this job for a year and a half, coordinates with Boston’s most vulnerable citizens—immigrants, low-income individuals, and people of color. “They are at the bottom of the list of people who get served,” she said. Her team creates social cohesion and a sense of place—offering activities like kayaking, coordinating youth organizers for service projects, building skills like English for speakers of other languages, and training people to become effective organizers within their community. 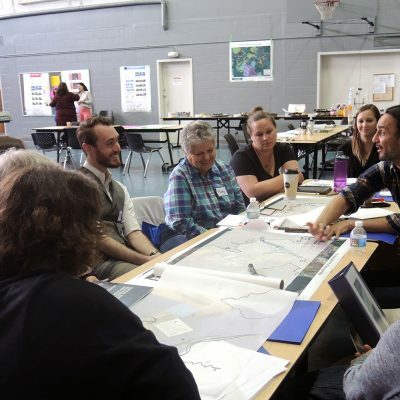 This planning builds on the City of Boston’s report, Coastal Resilience Solutions for East Boston and Charlestown, which identifies flooding risks and solutions for East Boston. Boscio Santos said NOAH wants to expand that work, further ground it in the community needs and desires, and make sure this goes beyond reports, to real-life projects.